​The truth is that this is probably not a quilting book, but quilting is mentioned once – kantha quilting. However, many of the techniques covered consist of a lot of layers, of anything, and lots more stitching. They mainly focus on different two and three dimensional items created from stitchery, fabric and mixed media. The first part of the book concentrates on structure as a source for design and how you look and interpret them. There are some good sketches and illustrations of organic, natural and man-made built structures. These give inspirations for stitching. After each major subject throughout the book, there are suggestions on further work that you, the reader, can do. 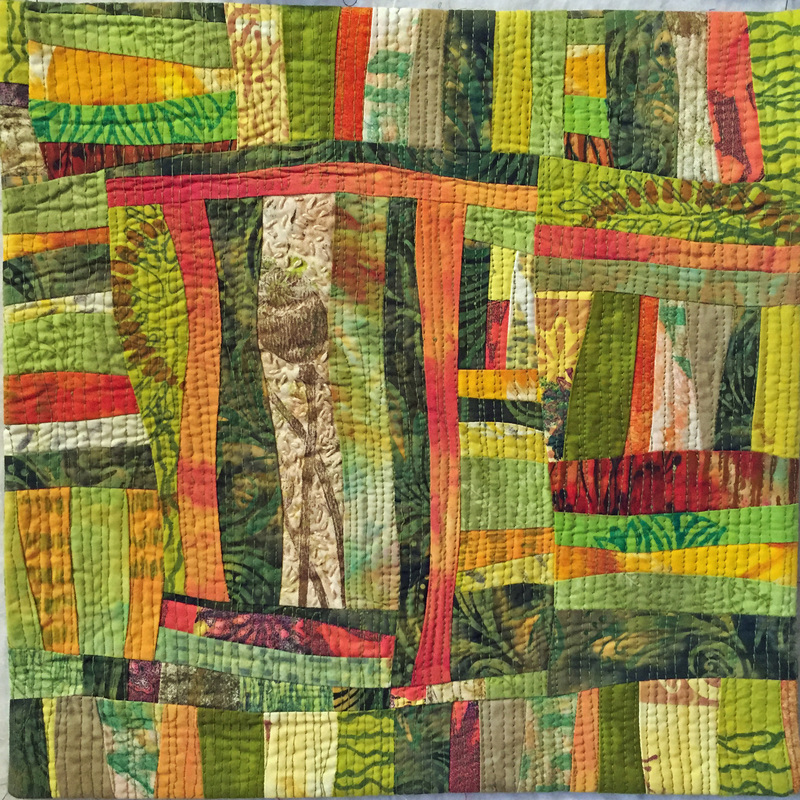 Jean Draper describes her approach to making experimental stitched textiles and the methods used. There were some excellent reasons given why drawing structures are so important and again the illustrations were perfect. And also on taking risks! Next the book covers thread and that really means altering conventional threads and inventing new ones. Lots of innovative ideas are given. This is followed up in the next chapter by discussing and constructing with thread and linear structures in order to make two and three dimensional work. Plenty of good and unusual examples are given including clear instructions on coiling. This is followed by stitches in thin air – using soluble fabric – for fragile, hand-stitched structured surfaces and a stabilizer, for constructed work. So no conventional background fabric! Lots of good, not obvious, techniques are described. The author describes constructing with only stitch, to produce two and three dimensional stitched structures made without a background fabric. She also explains making and using moulds for shaping stitched structures. Buttonhole stitch plays an important part in these methods. The book then deals with structures using stitched fabric - making new surfaces from fabric using both hand and machine stitching in order to transform the surface and character of existing fabrics. There were some stunning examples with clear instructions on how to achieve the effects. This is where kantha quilting is described. ​I thoroughly enjoyed reading through the book and picked up some good ideas, some of which I will definitely use and others which… maybe! If you want to add textures and dimensions to your work, I certainly recommend the book to you. It is easy to read and always followed up with suggested further studies. To sum up – an inspirational book. Fons and Porter are “legends in the world of quilting” but this book was my first introduction to their work. It is a beautifully photographed work full of charming projects for a range of abilities. The book is a new addition to the London Quilters Library and supplements the small section of quilts for babies and children. I first made “Happy Flowers” - a sunny, cheerful baby quilt described as “easy”. I would agree. It went together with no trouble using the detailed instructions. A great project for a beginner or a quilter who would like to put a baby quilt together quickly using scraps. I then went on to “Teagues Turtles” – a foundation pieced project described as “intermediate”. I have had some experience of paper piecing using freezer paper but I found this challenging. There is a clear design for making the turtles but I had problems with it. The placement given didn’t work (although it was easily modified) and I then had two pieces which when cut turned out to be upside down. There are instructions in the book for how to paper piece but there are better instructions elsewhere on the web. The issues with “Teagues Turtles” aside, this is a lovely book, full of fun designs which will delight the recipients. ​​“Baby and Kids Quilts” by Marianne Fons and Liz Porter. Published by Leisure Arts 2011. A stress-free journey to original design. This is a book that encourages the reader to try a different approach to quilt making. 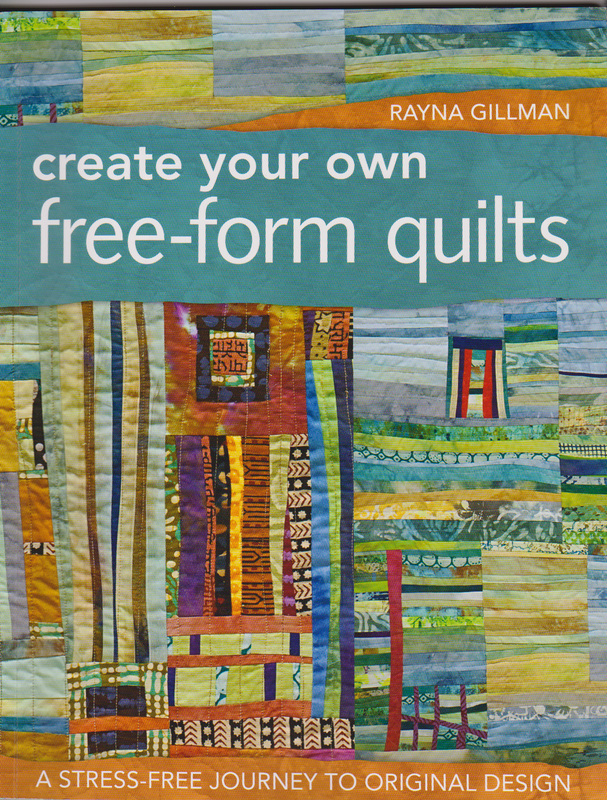 The author, Rayna Gillman, has her own unique way of creating “free-form” quilts . She teaches this method to classes all over the world. The book offers a rich resource to help you jump-start this new direction. The reader is gently led through simple steps such as “sorting your fabrics – commercial or hand-dyed and printed”, or “colour and shade” and novel suggestions are made such as “mood or motif” or “mixing it up”. In fact almost anything goes with a little control and management. This book is not simply about design. It is about making original work and proving that this is within the reach of everyone. Most importantly Rayna’s book shows that individuality can be fun as well as easy. It all starts with a “strip.” Choose your own length, your own width, your own style of fabric. Everything will work and most excitedly, you are in control. Then add another and maybe a third. Maybe add one in another direction. Then cut it in half.....and you’ve started the journey. You are encouraged to abandon the rules. You can dump the ruler and also forget everything you learned about colour, technique, bindings, straight edges etc. Just let go. Hold Rayna’s hand and she will point you on the way to this different direction. You will not need to buy anything. Everything you need you will find in your workspace. Most importantly you will be able to use your unfinished blocks, scraps and all those fabrics that you thought were mistakes. Nothing need ever go to waste again. All those UFO’s can be re-created but this time into something you like. Chapters with headings like “Slice, Dice and Design “, “Add, Subtract and Divide” offer easy solutions that result in energetic and unique possibilities. No two readers will create the same work. It doesn’t take long before you are actually making your own creations based on Rayna’ s individual approach and quirky ideas. And to give Rayna the last word - “there is no such thing as a mistake”.